It will spawn 1 three-layered waffle every 2 moves. First break candy cane curls, waffles and jellies as many as you can. Striped candies will fall from candy cannon, use them to break icing blockers, more candy cane curls, waffles and jellies. 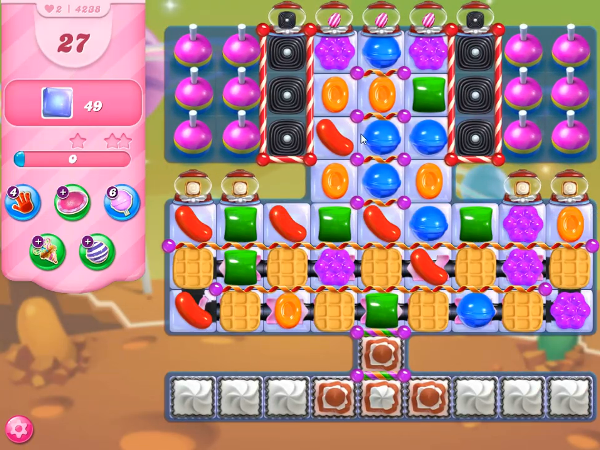 Then make special candies and combine special candies to break remaining candy cane curls, icing blockers, more waffles, jellies and to hit bobbers to activate jelly fish to break remaining jellies to complete the level.